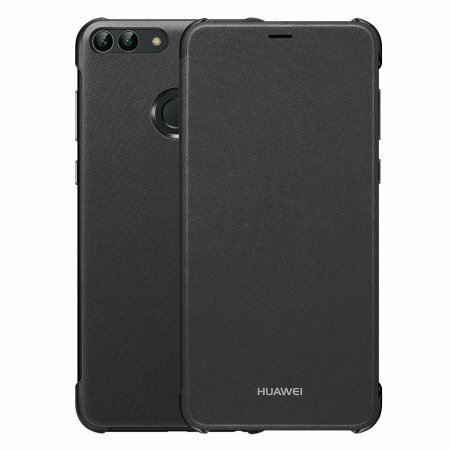 Combining an attractive, professional build with sturdy and durable protection, this official Huawei flip case in black is the premier option for your Huawei P Smart 2018. Crafted from the finest materials, the case provides a sophisticated feel. A simple phone case, that does the job at a good price. Attractive and quite solid. Not bulky keeps the line of the tel slim. Nice understated gold colour. Very pleased. This is the second cover I have ordered. I returned the first one because it didn't fit the phone. The first one was a better product, with card slot and matt finish. This one didn't fit either UNTIL I realised that you have to take the back off the phone and fit the cover! I wish it said that somewhere! All the information contained within advertisement was accurate, the cover really enhances my phone is very neat and not bulky. I love it !! Looking for a protective cover for my new Huawei phone. This item was very smart and the colour ideal for me as a lady with good taste. I went by the information shown and was not disappointed. It is good quality, a good color and works very well. Love this cover , gold colour really matches my phone feel rather posh with it . Good quality and easy wiped clean. It's a lovely case but not suitable to protect phone and screen, dropped my phone today, phone came out of the case while falling and smashed on the ground, screen completely smashed. Very good stylish quality cover. Very pleased with the product. Only possible improvement would be a pocket inside to hold a credit card or train ticket and perhaps a magnetic close tab. Very smart and sleek case. Fits well. The hinge might become weak with wear, but very happy with it so far. Continued: but I got one where the camera cut outs are wrong. On letting them know this they asked for pictures so I sent some. Two weeks later and I haven't heard back. Luckily I've found a case that fits perfectly and more important it was cheaper!! Unfortunately for me it seems I've lost £17.00 due to me being too principled and refusing to pay the return postage. Bottom line:, why show a video with one case and then send a different one?!! Obviously I'd never buy from them again but it's up to the individual if they choose to do so. I bought the phone case as it was the 'official' one for the model of phone. Nothing fancy...does the job. Reviews of other cases for the P20 stated difficult in accessing charging port etc. As this was an 'official' Huawei product, I expected a lot more. There are far better 'cooies' or alternatives to this at much better prices. The product is flimsy & poor quality,i managed to find a genuine real leather option for half the price. The case is what it says it is as far as function goes and is fine BUT the colour shown in the advertising material is not what I recieved. Light blue shown, dark blue received and as always I can't be bothered sending it back. 1st class service, quality product at a reasonable price. The image looks as if the front folds over whilst not obscuring the camera lenses. This would be especially useful when taking selfies. Of course the logo wouldn't be showing then but on initial viewing this may not be noticed. Having front and back images in line can lead to confusion. The colour is really nice and the material is of a good quality. I wish the cover was magnetic as it doesn't fully close, however this doesn't bother me as much the more I get used to it. The case fits the phone perfectly and looks really nice, however there were a few tiny marks on rear of case. The cover fits my phone perfectly, was great value and delivery was very efficient. Was quite flimsy. Not what I expected. I bought a much sturdier one locally which I'm delighted with. Wouldn't feel my phone would be safe if i used this case. Works well and feels well protected. most important or item fits 100% or it is longlife. The case protects the phone so it does the job. Thin, lightweight, good looking flip case, easy to fit and does what its supposed to do.. Does not fit the mobile properly. The cover didn't close tight. Very good case, good quality & looks like it's going to last. Also pleased with the fast delivery time - 2 days. ! The P Smart case fits the bill, pleased with the colour, pleased with the fit, pleased with the thinness . No complaints!! Great product. Nice and light in weight. Just what I wanted. Well made and looks good also. Most happy with the purchase. The colour is pretty true to the photo shown. The front opening cover is flimsy and not really what I expected (thought would be much tougher). Haven't dropped the phone (yet) but would be slightly dubious to the protection it will provide. However the phone slots in nicely and it seems secure. Not a bad cover but it is a bit pricey for what you get. I found this perfect. It is smart and easy to find because of the colour. This case fits the Huawei p-smart like a glove. It is very good quality and looks great. I have no concern that my phone might fall out. The case is fairly lightweight and flexible and has quite a nice texture. Definitely worth the cost. nothing else - read the reviews and it is as expected. Fits perfectly, great colour making my phone and smooth feel to the touch. Light and smart but feels a little insecure, not sure it offers much protection to the phone. This is an okay case. Material is high quality but the front cover could benefit from being a bit more rigid. The opening and closing of the case does not turn on/off the phone. Personally, I would have expected a higher quality/build for a case made by the manufacturer. The cover does exactly what it says on the tin. I bought an Huawei P Smart (blue) and the cover matches it perfectly, really pleased. Really pleased with purchase. It looks really smart, not bulky at all and the colour (gold) is lovely. So easy to fit too. Excellent service from Mobile Fun and would use again. My phone fits perfectly in the case which is of excellent quality. I feel that the case would benefit from some sort of fastening to keep it closed. Only thing I find with the that it appears to mark easy. When I looked at the photo and subsequent video, I was impressed with the look and colour of the case, but looks can be deceiving, however, I ordered, and when I received the item, I have to say I was, and still am well impressed with my case. Smart, slim phone cover from Huawei. Needed the genuine item for new phone. Robustly made as well as smart and subtle colour. Great. It's a high quality piece of kit that protects my Huawei P Smart. It's very light and doesn't make the phone bulky. It looks very smart and elegant and is lovely to handle. Can speak with the case closed. Cool. Durable. Does the job perfectly, ie protects my phone. What more can I ask? The blue colour is in fact dimmer or duller than on the picture. From practicality point of view it does the job, it's a fine cover. I am very happy with the phone case it's a lovely colour and matches description. My case arrived shortly after ordering. It is very good and protects my phone very well. Many thanks Mobile fun. Fits well. If You do not need the inner card slots then this case i good for You. Quick turn around from Mobile Fun. Smart looking case. Case looks smart and makes the phone much safer to handle. Only down side is when the cover is folded back you can't access the finger print scanner to unlock the phone. Previously for years had top of the range Samsung mobiles cases Having recently purchased Huawei p smart budget phone amazed at quality.However mobile fun again supplied me with the official case for the Huawei mobile I'm amazed at the price and quality of design brilliant thanks again mobile fun cheers. Genuine Huawei phone case with protective corners. Perfect match to colour of phone. Case is nice, I get pack after 2 days. 0 problem, highly recommended! Nice colour. Easy to clip on. More than I wanted to pay. Delivery quick. Excellent purchase-bought for my brother in law. He seems very pleased with the case. Does exactly what it shpild-protects the phone and isn't bulky. As usual excellent delivery and service from mobile fun. A real professional quality phone cover. This item complements the stylish Hauwei P Smart. The phones appearance is not compromised by adding this flip cover which is in its self a quality product. It adds protection and style. Phonene and cover in perfect harmony. Easy to order and just what I was looking for. The case fits the phone well and seems, so far, to do the job it is meant to do, i.e protect the screen and edges of the phone from damage whilst being carried ina pocket or bag. I was after a leather case for my new P Smart but as the phone is quite a new model I couldn't find one so opted for the official Huawei case as an interim solution. It's a smart looking case, but doesn't look like it offers much protection and for what it is should have been a lot less. Great looking and feeling to the cover. Very smart. Don't be put off by the word 'Flip' the cover opens like a book.